Dundee Comics Creative Space is excited to join forces with Scottish Ensemble, a dynamic string orchestra based in Glasgow, for an evening of DeeCAP comics performances brought to life with live soundtracks and featuring comics by Ink Pot artists including Damon Herd, David Robertson, Zuzanna Dominiak, Andy Herd and Norrie Millar. 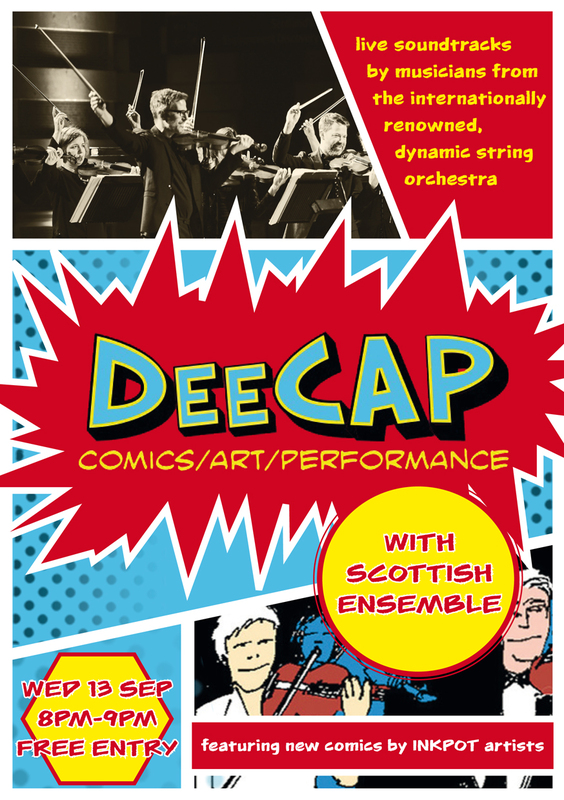 Posted on September 1, 2017 by dundeecomicscsPosted in Events, performanceTagged deecap, dundee, music, orchestra, performance, scottish ensemble. We had a great time at the opening of Ink Pot, our newly-branded comics studio on the evening of February 8th. We also launched Time & Space: An H.G. Wells Comics Anthology, a comic created as part of the University of Dundee’s contribution to the Being Human Festival. The winners of the competition to create a strip for the anthology were in attendance to pick up certificates for their achievement, as well as their own copies of the finished comic. The was also a DeeCAP session of comics and performance, which included Boney M, cosplay, missing castles, and detective stories, as well as performances of strips from Time & Space. A great night was had by all, as can be seen in the photos below. A big thank you to Cara at media services at the University of Dundee for the photos. Ink Pot studio manager Norrie Millar cuts the ribbon to officially open the studio. Ink Pot artists Elliot Balson and Anna Coughlan reading Time & Space. Time & Space organisers and winners. From L to R: Dr Daniel Cook, Norrie Millar, Colin Maxwell, David Robertson, Michael Philp, Molly-May Lockhart, Andrew Strachan, Professor Chris Murray, and Dr Keith Williams. Posted on February 21, 2017 March 1, 2017 by dundeecomicscsPosted in Ink Pot, science fictionTagged comics, deecap, hg wells, Ink Pot, performance, time and space. Watch the specially created comic FRANKENSTEIN BEGINS come to life! The play will have interactive elements, allowing the audience to meet Mary Shelley, author of the famous Gothic novel, and her real-life friend Isabel, daughter of a local jute baron, as she fuels her imagination in the City of Discovery. In association with DeeCAP. Free but ticketed, visit the FRANKENSTEIN BEGINS eventbrite page to book. This event is associated with the Frankenstein Begins: A Comic Workshop and Exhibition on display at The McManus Art Gallery & Museum, which will be launched on Saturday 21 November, 2-5pm. Part of the Mary Shelley’s Dundee series of events running as part of the national Being Human Festival. The FRANKENSTEIN BEGINS is by Chris Murray and Norrie Millar. Posted on October 28, 2015 by dundeecomicscsPosted in EventsTagged chris murray, comics, deecap, dundee, frankenstein, mary shelley, norrie millar, performance.